That each bat roost, in addition to its great hygienic value, is in itself a little gold mine, by reason of the cash obtained from the natural high-grade fertilizer, the guano, which it will constantly produce. In the first place, no such thoughts would ever enter a normal man's mind, but if such questions were asked, the listener would forget the questions and think only of and pity the questioner, concluding that the insane-asylum authorities had been derelict in their duties. And suppose it should be further stated, that, in addition to being made the recipient of free new goods that would yield him large profit, he would be doing the noblest of all deeds, helping his fellow man! Helping his neighbors and their little children for miles around to be more happy and contented! He would now not merely think, but would firmly conclude, that the insane-asylum authorities had lost their star boarder, and that he had found him. While these statements, measured by a sound, practical, business mind, appear idiotic, they nevertheless describe the true conditions an owner experiences when he acquires a bat roost, or a bat cave which he works for commercial purposes, because he becomes associated with, depends entirely upon, and relegates his enterprise to an associate, who furnishes to the enterprise her most wonderful creation. Failure in association with an infallible associate is, of course, entirely out of thought, hence what appears as so extraordinary, so idiotic, becomes an actuality. That infallible associate is Old Lady Nature. The bat-cave owner removes tons of bat guano from his cave during the winter, and never gives the place another thought until he returns the following year with his "cave men" and equipment, ready to remove the new tons which have been replaced by the Infallible Associate. The term "cave men" is a trade name peculiar to the business of harvesting the bat guano, and does not mean the wooly, ante-diluvian, hide-covered, long-haired missing-link we see in pictures emerging from a cave with a club and looking for trouble. Going into a bat cave is like going into an ice factory in which the ammonia pipes are leaking badly. The crew that usually is employed in gathering this valuable fertilizer is composed of men accustomed to doing this kind of work. It is truly remarkable how long these men can exist in an atmosphere in which the oxygen is almost replaced by the ammoniacal gases constantly generated by the decomposing guano, and by the fresh gases liberated while overturning the guano and sacking it. The cave owner knows better than to take with him at harvesting time a crew of inexperienced men, as they would either throw up the job or emerge from the cave every little while for fresh air. As the caves are usually miles from the railroad, he provides himself with experienced hands, who, technically, are referred to as "cave men.'' The harvesting of the guano is usually done in the winter, because the natural heat of summer is greatly increased by the chemical heat generated by the decomposing guano; besides, the work in the cave at this time disturbs the bats least, as they are then hibernating. A bat-roost owner offers to his associate superior inducements, which result in great good to both owner and associate. He, therefore, enjoys a pronounced advantage over the cave-owner who cannot tender these inducements, but must accept the association on terms offered by the associate. We will refer to this matter a little later. There are many caves in Texas inhabited by bats, ideally situated, that have no commercial value on account of the caves leaking, so that after protracted rains the nitrogen is leached out of the guano, which thus loses its commercial value. Other caves that do not have these serious defects are situated in such inaccessible places in the mountains, and so far from the railroad, that the cost of building wagon roads to reach them is entirely prohibitive. The enormous mouths, or entrances, to some caves render their commercial value almost nil, on account of the facility with which moisture enters the cave. On foggy mornings the side walls of the caves fairly drip with moisture, which, of course, leaches out the nitrogen. Through some caves pass underground streams; in others, springs are found, both producing evaporation that keeps the guano moist, and the same undesirable conditions obtain as those in a large-mouthed cave. One of the most conclusive and uncontradictable arguments in support of the assertion that it is precisely the mission of the bat roost to eliminate malaria and mosquitoes in the low lands and swamps, where they reign supreme, is the fact that in certain enormous caves, from one of which as much as ten carloads of bat guano have been removed and sold, there is not now a single bat. An example of this is seen in a cave in Brewster County, Texas, some 110 miles from the railroad on the bluffs of the Rio Grande on the American side of the river. At best the rainfall in this region is exceedingly slight, and in the last few years there has been no rain at all. The cave owners in that portion of Texas report that the bats have nearly all left on account of the climate being too dry, and accordingly no mosquitoes. Perhaps, when the seasons change and the rainfall increases, the caves in that region will again become tenanted. "I work two bat caves, one 19 miles from Sabinal, the other seven miles from here (Bracken). They are known as the Cibolo cave and the Frio cave. The Frio cave is a very large one, and yields about 80 tons of guano annually, but I lose about 20 tons on account of its enormous size and some colossal boulders, which prevent gathering all of the deposit. The Cibolo cave yields on an average of 75 tons annually; it is much smaller than the Frio cave, the bats are not so scattered, and I have a smaller area to work. I have, however, the same trouble in this cave that I do in the other, viz., large rocks which prevent me from gathering the entire deposit. However, in a wet year, when all water holes are full, and there is plenty of water, I count on a heavy car load more from each cave. You know the reason why. 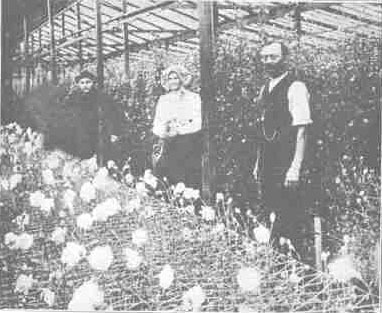 I make large shipments to Crystal Springs, Jackson, and Hazelhurst, Miss., though sometimes I have shipped the entire crop of my Cibolo cave to Laredo, Texas, on account of an extensive onion industry developed there." Bat guano, like ore, is sold entirely by analysis, the nitrogen and phosphoric acid being the most valuable commercial constituents. It contains also three pounds of iron (as shown in the "Functions of the Spleen"), 14 pounds of potash, and 29 pounds of sulphur to the ton. These three constituents have no commercial value per se, but they are of great value to the guano, as they are of such a chemical nature as to be known, as ''available;'' that is, they are fit food for plant life, without undergoing further chemical changesmost important of all, they are in the proper proportions. Milk is the ideal food for mammalian life, not only because it contains all of the elements of nutrition, but because it contains them in the proper proportions placed there, in that manner, by the only infallible chemist, Old Dame Nature. In bat guano, she distributes the iron, potash, and sulphur in those exact proportions that make it as ideal a food for plant life as is milk for the human. Nitrogen has sold as high as $8.25 per unit, and phosphoric acid as high as $3.25 per unit. . 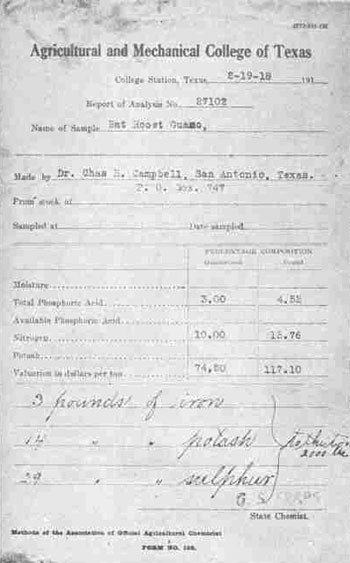 In order to protect the agriculturist or truck farmer, the law in Texas compels all dealers in fertilizers to have their product analyzed, and to attach to each bag a printed tag, furnished by the State Chemist, stating the guaranteed percentage of both nitrogen and phosphoric acid. The fertilizer may contain more of each than the guarantee calls for, and the dealer will be paid for the full amount it contains, but he must attach a guaranteed amount of both these chemical constitutents. The wisdom of the law is quite obvious. The buyer is protected from being sold bat guano of an inferior quality, which would be such as gathered from a leaky cave, and in which all of the nitrogen would be leached out. Chemical Analysis of Mitchell's Lake Bat Guano. It is in very dry caves, only, that the best guano is found These caves are quite scarce and very valuable. The largest percentages from a really valuable cave will reach as high as 8 per cent of nitrogen and 4 per cent of phosphoric acid. Where the caves are easily accessible, even if the percentages of nitrogen and phosphoric acid in the guano are only one-half of those in the output of the best caves, it nevertheless pays to, work such deposits, because the "associate" has furnished them gratis, and as the guano costs the cave-owner nothing. There have been quite a number of people in this country, Cuba, and Mexico badly "stung" by going into the bat-cave business without any previous knowledge or experience in that branch of commercial pursuits. In contemplating the purchase of a bat-cave or its contents, the prospective investor should exercise great caution before he makes what appears to be a most alluring investment, as he might be sinking his money in one of the undesirable caves already described. The bat-cave owners of Texas who work their caves, usually have their regular buyers, and to these they ship annually their entire crop. In the large cattle ranches of West Texas are some caves that could be harvested to good advantage; but the cattleman is content with the raising of his cattle, and doesn't bother about bat caves. If an association, organized on the basis and following the plans of the wonderfully-successful fruit-selling associations of California, would take hold of the bat guano of Texas, millions of pounds of this valuable fertilizer could be placed on the market, and the soil of this great commonwealth would Be wonderfully enriched. During the war, when the question of food became a burning one, the author, desiring to do his "bit," organized the Texas Bat-Cave-Owners' Association, with a view of introducing this Nature's fertilizer into general use. It was attended by 18 or 20 interested cave owners. Officers were elected, by-laws adopted, etc., but, as the war ended, interest in the Association slackened, and it now only awaits some guiding hand to place it in the important economic position where it so deservedly belongs. The officials of the Southern Pacific Railroad Company estimate the bat guano handled annually over their road out of Texas at fifty carloads of 30,000 pounds per car. From the territory northwest of San Antonio, it is estimated that 15 carloads are shipped out, making a total of 65 carloads of this valuable fertilizer produced in West and Northwest Texas annually. It is not only man in quest of gold and Nature's creatures in quest of food, that invade the solitude and disturb the serenity of the wilderness homes of this noble creature. Mars savagely takes possession; and the ennobling pursuit of enriching the soil, thereby bringing happiness and plenty, at his dictation is converted into the demoniacal making of gun powder that brings death and desolation. In the early ''Sixties'' when the war lord blew his pestilential breath over this beautiful country, and the fraticidal struggle followed, he caused these noble creatures to become his valuable allies. The Confederacy, finding its ports effectively blockaded, particularly in the latter part of 1863, established a powder factory a few miles below San Antonio; and the powder's most valuable ingredient, saltpeter, was made from bat guano gathered from the nearest caves, from 30 to 60 miles distant. Huge hoppers were made of cypress lumber hewn from trees close by, or from large flag stones, and were erected on streams or water holes nearest the eaves being worked. The guano was brought in wagon loads or in sacks to the hopper, in which it was put in layers alternating with wood ashes, the said layers being separated by strata of broom weeds. As the water which was then poured into it gradually filtered through, it was put into a series of large, open, cast-iron boilers, which were fired; and when the liquid was reduced to the proper specific gravity, it was conducted into large shallow pans, where the saltpeter crystallized by evaporation, and was sacked and shipped by ox-team to the factory, miles away. It is most interesting to hear the story of making saltpeter from the bat guano as told by one of the actors in that drama. They worked with oxen and burros, neither of which they were compelled to feed, because the soil furnished their fodder in abundance. They made a wagon road to the cave where that was possible, or a trail in the mountains for the sure-footed burros. 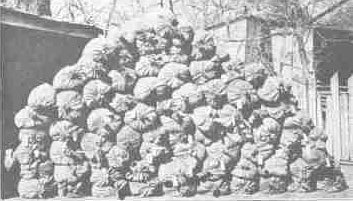 The burros were trained to go into a cave with a rawhide box strapped on each side, and when these were loaded, to return to the wagon, or to continue through winding mountain passes to the hopper to be relieved of their loads, and then to return to the cave. The favorite cave among these workers was the Verdi Cave, having a mouth large enough to permit a four-yoke team of oxen to be driven inside and the wagon loaded and turned around, with plenty of room to spare. Many were the vicissitudes endured; and an ever-ready and open eye for marauders and red-skins made self-preservation the main concern of those obeying the brutal calls of the war lord, who had this beautiful land in his remorseless grip. In the arguments offered for the demonstration of ALLEGATION THREE, it stated that a bat roost, which is man-made, is one of the few artificial things that are superior to the natural. Also, in one of the preceding paragraphs it is stated that the bat-roost owner ''offers the associate superior inducements, which result in great good to both owner and associate, and a pronounced advantage over the cave owner,'' etc. What does he offer ? A strong, well built, truncated structure that will last for generations, constructed on plans furnished by the associate, to which are added features greatly enhancing the association. Its shape and elevation from the ground make it singularly resistant to high winds and storms and depredations. During the summer of 1914 a terrific hurricane struck the Mitchell's Lake bat roost from the Northwest with such force as fairly to churn the water in the lake, but without as much as budging the structure. The "tragedies" mentioned as occurring in a bat cave, where so many baby bats and their mothers fall a prey to wild animals, cannot occur in a bat roost, as, no matter what place the mother bat might select for herself in the roost, when her baby falls from her embrace, it will drop into the huge hopper in the bottom of the structure, where it is perfectly safe from any enemy, as is also the mother when she flies down to the hopper after it. This feature conserves the lives of both, and as this indicated saving can be multiplied by tens of thousands, the value is quite patent, when we consider that each bat will, at a conservative estimate, deposit in one year 624 grains of guano. Another very valuable feature of a bat-roost is shown by the photostatic copy of a certificate of analysis from the State Chemist, which demonstrates a strong point in the commercial element of the cultivation of bats, again affirming the assertion that the man-made home of a bat is superior to the natural. It was stated that many bat caves are valueless on account of moisture sufficient to leach out the nitrogen, also that some caves are in entirely inaccessible places, and that eight per cent is the highest nitrogen-content the best cave-guano produces. We erect our man-made bat-home where we please; and, as we build it perfectly water-tight, the guano cannot be deteriorated by moisture. An analysis of it shows almost double the nitrogen content of the best cave-guano, and it correspondingly brings more than double the cave-guano price, on account of being bone dry, so that there is no moisture to pay for. The nitrogen content in a bat roost can be further increased, if after each accumulation of 4 or 5 inches of guano, the surface of the deposit is covered with a thin layer of any ferruginous earth or clay, which is to be found almost anywhere. These layers of earth would, to a great extent, prevent the escape of the constantly-generating ammonia. Of course this would not permit of the self-generating, ammonium sulphate feature, presently to be described. All of this valuable material, it matters not where the bat may be roosting, falls into the hopper, with attached chute, which is provided for just this purpose at the base of the structure. This chute, similar to those for filling sacks in a flour mill, is in the middle and on the outside of the roost. Unlike a bat cave that has to be emptied by severe hand labor during the winter on account of the heat and to avoid disturbing the bats, it can be automatically emptied at any time, or only as much guano taken out as is desired, leaving the balance thereof in the roost, which serves most admirably as a warehouse. Owing to the peculiar and intricate construction of the bat roost, a space of about three feet by ten feet at the base on two sides is unavoidably formed, which, so far as serving the bats to any purpose is concerned, might be referred to as "lost space"; but the owner, knowing some of the ways of his powerful and infallible associate, now assigns to her another duty which she gladly accepts, and proceeds to add laurels to the man-made home of her most wonderful creation. This new duty involves chemical affinity. Well fitting doors in two of the outside walls help form the triangular "lost space," which is provided with a perforated wooden floor. In this space are placed suitable shallow boxes lined with sheet lead, or coated inside with hot wax, and filled with commercial sulphuric acid. The perforated wooden floor allows the constantly-generating ammoniacal gases to enter the "lost space." This gas, which costs nothing, and which would otherwise be lost, combines with the sulphuric acid, costing 3 or 4 cents a pound, and converts it in the shallow boxes into ammonium sulphate that sells for 16 or 18 cents a pound. This chemical product is a highly-prized fertilizer, and is also used in the arts and in medicine. It was during the year 1921, that bats fairly swarmed to the Mitchell Lake lands. The Mitchell's Lake bat roost was simply choked with these creatures. They even clung to the underside of the projecting roof; on the inside they clung to one another in huge bunches. Two small cabins near the lake, that did not happen to be tenanted, were alive with bats. In the ten years that the author had been carefully observing these creatures, he had never seen them in such numbers. The bats in the cabins did not stay long; but those in the roost remained until the end of the season, and perhaps would have become permanent tenants, if they could have found the necessary accommodations. As a result of these innumerable visitors to the Mitchell's Lake bat roost, the guano crop of that year exceeded that of any previous year, amounting to 4,558 pounds. This was a most extra'ordinary migration; as, for the next two years, the roost settled down to its average production of approximately two tons per annum. During the last six years the author has sold all of the valuable fertilizer produced by his Mitchell's Lake bat roost in lots of one thousand pounds to florists, and in smaller quantities to private individuals for pot plants, lawns, etc., at very remunerative prices. While his family enjoys a nice little bit of "pin-money," with which many small wants may be satisfied, the real enjoyment and proud satisfaction he experiences are due to the good the bat roost has accomplished for others. This is evidenced by the smiling, contented, chubby faces of the healthy school children at Mitchell's Lake, who live within the influence of the bat roost, and who are kept in a most desirable condition of health by those transcendent little creatures and the infallible "associate." Hauling the 1918 crop to market4012 pounds. Mitchell's Lake Bat Roost. Guano crop for the year 1921, 4558 pounds. "My Back Yard." Fertilized by original method. It seems almost unbelievable that such a small structure produces such a large amount of the most valuable of fertilizers; and, as the hygienic element is so familiar to thousands of San Antonions, the author was desirous of exhibiting the commercial element to some of his friends. 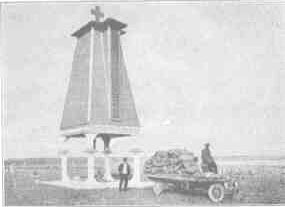 To that end, during the early part of January, 1924, the 1923 crop, just as it had been deposited by the bats during the year and amounting to approximately two tons, was viewed in the hopper of the Mitchell's Lake bat roost, by Mr. Ernest Steves, President of the Alamo National Bank, Mr. Ernest Brown, Vice-President of the same institution, Hon. Augustus McClosky, County Judge of Bexar County, Mr. Geo. D. Armisted, a writer representing the San Antonio Express, Dr. S. P. Cunningham, President of the Bexar County Medical Society, Mr. W. G. Higgens, Vice-President of the International Lions Club, Mr. Prank G. Huntress, General Manager of the San Antonio Express, and Mr. Albert Steves, capitalist and President of the San Antonio Chamber of Commerce. These gentlemen were astounded and highly pleased with what they saw, and were loud in their encomiums for the little bat and his man-made home. During the summer of 1901, the author and an esteemed friend of his, equipped with a farm wagon, a good team, and a well-filled grub-box, made a lengthy camping trip into the highlands of West Texas, travelling leisurely along mountain streams, continually inquiring as to the location of bat caves, which were the primary incentive of the trip. On one occasion upon being told by an old settler about where a large bat cave was to be found near a clear-flowing mountain stream with an abundance of water and perhaps some fishing, the campers, without the slightest hesitation, made for and found the place as described. The cave is indeed in a very inaccessible locality, requiring almost the agility of experienced mountaineers to reach it. This was the first large bat-cave with its millions of tenants and thousands of tons of guano that the campers had ever seen; and the feelings and emotions aroused by the sight in the cave, and by the emergence of the bats towards evening, simply cannot be described. It was during the summer of that year, and in the august presence of that cave, that the author firmly resolved to make the study of these creatures his life's work. The idea of the cultivation of bats was not a spontaneous one at that time, as that had been in mind and some work had been done thereon two years previously; but it was the inspiring sight of this large bat-cave in all its pristine force that furnished the enduring impulse to maintain unswerving efforts despite endless difficulties and hardships and unnumbered discouragements, with which the reader is by now pretty well acquainted. The author was then in the same position that any investigator will be in if he or she endeavors to solve the splendid problem outlined in "Dragon Flies," and undertakes to make those insects subservient to the welfare of mankind. The reader has been told of the many years it has taken to complete this work, and he has also been shown that it is now possible, as demonstrated by practical application, to have the valuable fertilizer, bat-guano, instead of being deposited in a cave in the mountains, and there go to waste, be deposited in a bat-roost on the plantation or farm of our cultivated lands, there to enrich twice or thrice the earth that furnishes us our nourishment, giving to the tiller of the soil a three-fold recompensehealth, happiness, and wealth. Pecan Tree four and a half years old, fertilized with bat guano. Every single pound of guano that a bat-roost produces enriches the soil and makes it yield bountiful crops. The two tons of bat guano the Mitchell's Lake bat-roost produces every year, and which are all utilized, mean two tons that have not gone to waste. A bat-roost which will last for a century on the farm, means the accumulation of Nature's fertilizer free of cost; even to the sacking, which would be quite unnecessary, as only as much as is required for immediate use on the said farm need be taken out at a time. Thus there will be saved the cost of the sacks, the labor of sacking the guano at the cave, the hauling of the filled sacks to the railroad, the paying of freight on the cave guano, and on some 15 percent of moisture that it contains, and the profit to the middle man. 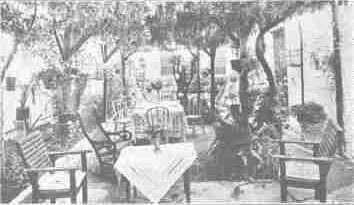 The photograph marked "My Back Yard" shows what can be done with this natural fertilizer; and, from results obtained, the method employed recommends itself particularly to the orchardist. In this instance, the guano was not mixed with the earth around the vine and spaded under, but was buried in the ground. A hole about two feet deep is dug at least five feet from the tree or vine, and a trench of the same depth and about 8 inches wide is excavated from the hole to the said tree or vine. In the hole are placed about 20 pounds of guano; then both hole and trench are refilled with earth. The object of digging the trench from hole to tree is simply to loosen the earth so as to facilitate the roots' finding the guano, which they will do with unerring certainty by sending an individual branch to the guano and covering it with thousands of little rootlets to carry the nutritive material to the mother vine or tree. 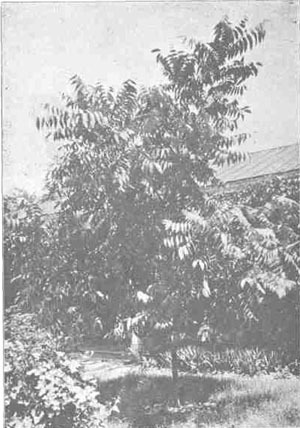 The pecan tree shown in the cut, was planted on Thanksgiving Day, 1920, when it was one and one-quarter inches in circumference and stood thirty-nine inches above the ground. In four and a half years it has grown to a height of 22 feet and 6 inches; and the circumference at 39 inches from the ground is just twelve inches. The first year, though it was well provided with healthy and uninjured roots, very little increment was noticed; but, about the middle of the second year, it took on a luxurious growth, with shining dark green leaves in abundance; and the increase since, as can be seen, is most remarkable. It is quite patent that it had simply obeyed the laws governing its kingdom, and that the loosened ground afforded it the facility of doing so, which meant the finding of its natural food that stimulated the luxuriant "growth which indicates its perfect nutrition. It now comes into foliage two weeks ahead of the wild pecan trees. By this method of fertilizing a protracted rain does not put the nitrogen in solution and wash it away, but it remains in the ground and becomes at all times available to the plant. This kind of fertilization needs to be repeated but once in five or six years, as the tree or vine has been provided with a larder that will last that length of time, or, in mining terms, it has been "grub-staked." But it is not only the orchardist, who brings us delicious fruit, that the bat through its guano serves so admirably ; it also serves the florist, who brings us his beautiful flowers,God's mute but eloquent poems which gladden our souls and enable us to pour out our emotion, the gentlest feelings of our hearts, in alleviating the woes of others with silenced lips. San Antonio-grown Hyacinths and Narcissi fertilized with Mitchell's Lake bat roost guano. San Antonio-grown Carnations fertilized with bat guano from Mitchell's Lake bat roost. The photographs marked "San Antonio Raised Flowers'' are a striking illustration of the nourishment this natural plant-food furnishes, as these were all fertilized by pure bat guano. 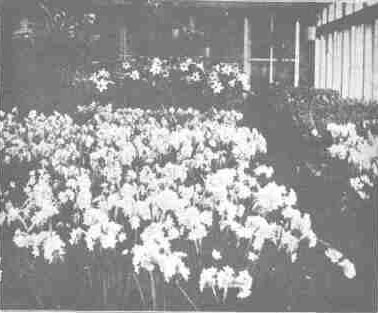 The superior quality and matchless beauty of the carnations, sweet peas, Easter lilies, narcissi, and hyacinths show for themselves; and if these flowers could speak, their little voices, as delicate as the flowers are sweet, would rise in one dulcet chorus offering thanks to their enterprising owner for having provided them with the food their Master intended they should have. By no means does the author think that the resolution he made in the wilds of Texas 24 years ago has been carried out to completion, for the study of bats is unquestionably an unbounded field. The work, however, as originally projected, is, to all intents and purposes completed; but for this achievement the author neither claims, nor is entitled to, credit or praise, as it was not completed by him, but, as often before stated, by the most powerful of all agencies, Old Dame Nature assisted by Father Time. It is the work of these two masters that the author desires the world to see; and, to that end, a most cordial invitation is extended to any one desirous of investigating. The author will take great pleasure in showing him or her all courtesies, and will provide all facilities for the most searching investigation. Everything is as wide open as Nature herself; there is nothing to conceal. The best and most crucial time for such an investigation is during the height of the mosquito season in August and September. In conclusion, and as a résumé of the entire dissertation, it may be said that the bat catches and eats that most malevolent of insects, the malarial mosquito, and then, as if to punish it for its malevolency, converts the insoluble remnants of its little poison-carrying body into the highest of fertilizer, the guano, thereby enabling us to make four blades of grass grow where only one grew before.